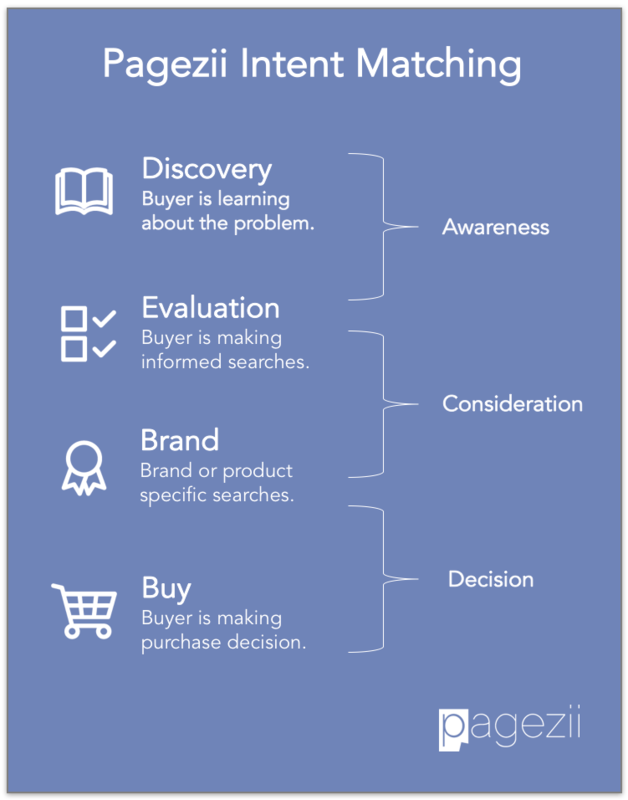 Buyer’s Journey Definition: A buyer’s journey is the path a typical buyer takes as they become aware of their issue, research their options, evaluate their final picks and make a buying decision. The process helps marketers identify the needs of the buyer and address it in all of the buying stages. These are high-level contextual searches that define the general problem or issue the buyer experiences. The buyer is looking to be educated on the solution and is inclined to read Wikipedia, blogs, and articles. The buyer has a clear definition of the problem and is better informed. This is when the buyer uses industry terms to search for actual solution sets. For example, searches may end with “… system” or “… application” to signify the search for a specific solution. The buyer is looking for concrete solutions, so product feature pages, white papers, and data sheets content satisfy the buyer. This is the last stage, where the buyer is ready to make a purchase. The buyer is evaluating many factors, including features, price, and business value of the alternatives. Searches in this stage usually look for the brand (either the company name or product name searches) and qualify it further with “… price” or “… review” type searches. The buyer is ready to purchase and looking for that final piece of information to make a decision. The 3 stages are a hypothetical path a buyer takes from the initial stage to the final stage. Bear in mind that not all Buyers flow through these stage in a linear fashion. Some buyers are extremely informed and make a quick decision. Other times, you get buyers who are stuck in the research stage for very long, because their need isn’t as strong as to compel them to make a decision. 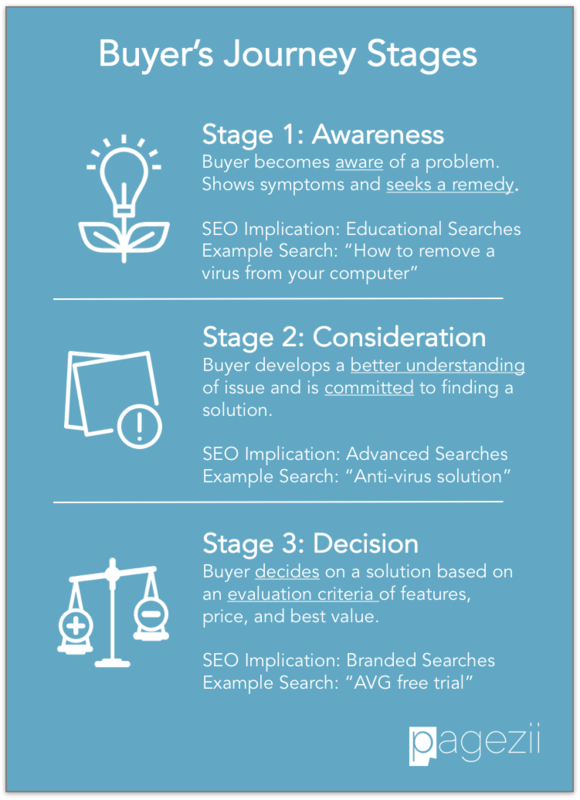 The diagram below further explains the Buyer’s Journey Stages. From an SEO perspective, there are certain advantages to aligning your keyword strategy with the Buyer’s Journey. By creating content that satisfies each stage of the buying cycle, you can create multiple entry points to capture new buyers and also limit leaks of existing buyers in your pipeline. 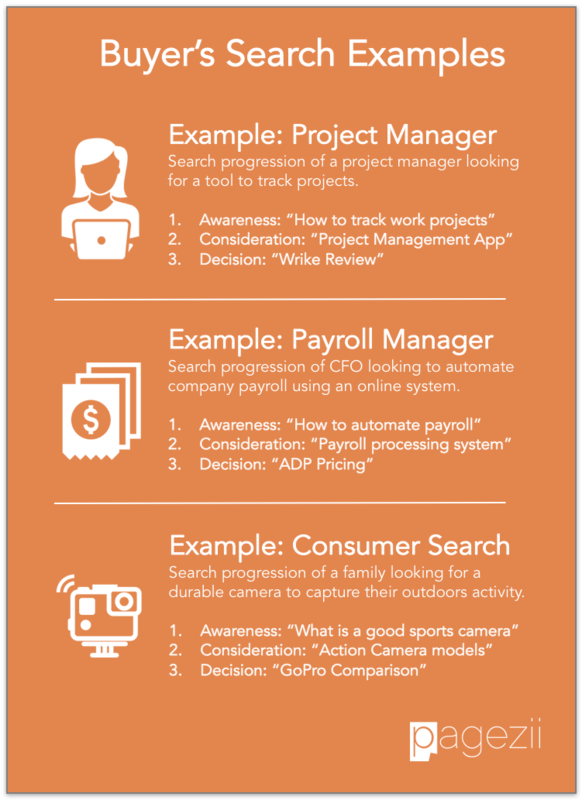 Imagine a project manager is searching for online tools to track her team’s tasks, resources, and projects. Her initial search may start with laymen terms of “How to track work projects”. This would yield many “How to” blogs and articles. During this Discovery stage, she realizes she should solidify her search by looking for a “project management app”. Now she’s moved to the Consideration stage where she’s evaluating different solutions. After she’s narrowed down the field of players to a handful, she is in the Buying stage. She’s searching for pricing, reviews, and comparison matrix before she makes her final decision. This example is explained below along with a search for an online payroll system and a GoPro camera example. By understanding how searches develop through the buyers journey, SEO managers can bucket keywords together for each stage. For example, Discovery Stage keywords may help define the problem or solution using laymen terms. In the Consideration stage, industry defined keywords may be used. And in the final Buying stage, keywords around Brand and Brand value are used. This is why at Pagezii we’ve developed our own Keyword Analyzer Tool that helps to show the Buyer’s Search Intent. The tool also helps rank the difficulty of a keyword and lists the top 10 Search Engine Results. This tool is a great way to learn about how users are searching for this keyword and what they expect to find. And whether it’s feasible to rank well for this keyword depending on organic competition. Give the Keyword Analyzer Tool a try. Discovery: This is the stage when the buyer is first starting off. The search type is basic, using laymen terms. Consideration: This is the stage when the buyer is learning more about the solution and using industry-specific terms. Brand: This is the stage when the buyer is conducting brand or product specific searches. Buy: This is the final stage. When the buyer is making a purchase decision. These 4 groups overlap with the Buyer’s journey as shown in the diagram below. Using our Keyword Analyzer Tool, you can develop a coherent SEO strategy that matches with the Buyer’s journey.